Time as a sediment that implicitly penetrates everything and everyone. The transparency and viscosity of the installation helps to bring that sediment out, which is often treated as dirt. The key point of the process is when face meets the tape in the fleeting moment of recollection. It penetrates through the analog layer and the resulting image is digitally fixed and transmitted onto the screen. The shift in time and space, highlighting the ephemerality of existence, creates the image of the passing of time invisible to human eye. Kamila Wolszczak (PL), born 1988 in Chelm. She has a BFA degree in Painting of the Faculty of Fine Arts, Maria Curie-Sklodowska University, Lublin, and an MFA degree in Fine Arts Education / Art Mediation of the Eugeniusz Geppert Academy of Art and Design in Wroclaw (major: “Curator of exhibitions and public art interventions”). 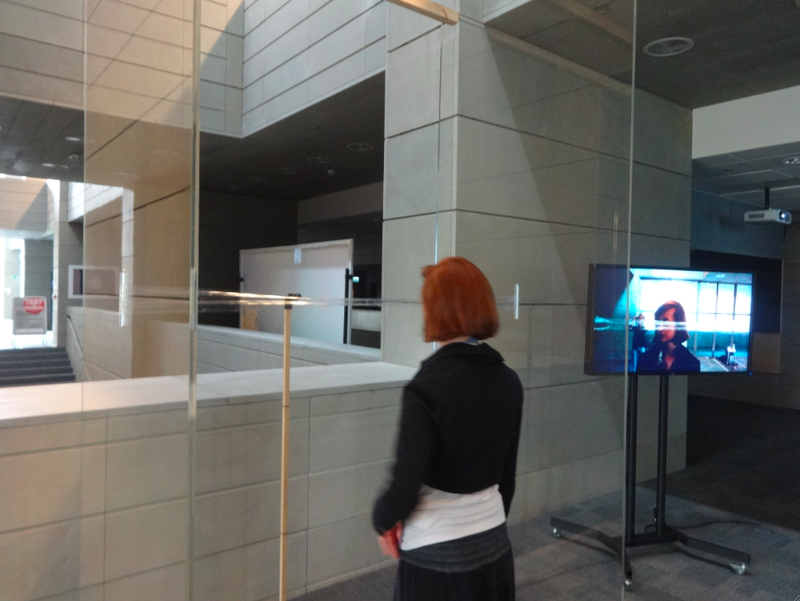 She deals with the viewer—artist—space relations, using performance, installation and drawing. The main topic of her works is time, motion and process. Her projects include: “Melafir” (The 4th International Sokolovsko Festival of Efemeral Art KONTEKSTY, 2014), “Sticky fingers” (DomoFonia project, Wroclaw, 2014), “Relations” (Muza space for art, Jaffa Tel Aviv, 2013), “Layers” (MD_S Gallery, Wroclaw, 2013), “Passing” (H2O Gallery, Barcelona, 2013), “Striptease Conceptual Kamila&Kamila” (Festival of Striptease Conceptual, Valencia, 2013), “Inflow—Outflow” (CK Agora Gallery, Wroclaw, 2013), “Temporality” (SURVIVAL 10, Wroclaw, 2012). Author of an independent curatorial project of the Universal Self-Supporting Exhibitions realized in abandoned spaces.